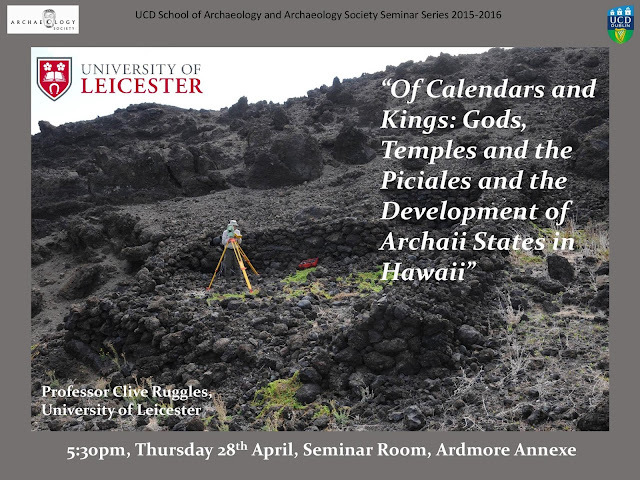 "Of Calendars and Kings: Gods, Temples and the Piciales and the Development of Archaii States in Hawaii"
The lecture given by Professor Clive Ruggles from the University of Leicester was on the topics of astroarchaeology in the prehistoric societies of Hawaii and Polynesia, the evolution of the Hawaiian Archaii states and how the stars and the natural Hawaiian landscape have influenced the orientation of various temples throughout Hawaii and Polynesia. Professor Ruggles has spent the last ten years studying the ancient temples strewn throughout Hawaii and attempting to decipher their enigmatic relationship to the southern constellations. In addition to his main thesis on the Heiau (religious temples) of Hawaii, professor Ruggles explained the history and archaeology of the astronomy within the Hawaiian society and why the stars played such a prominent role within the beliefs of the Hawaiian people. Professor Ruggles began his lecture by detailing the evolution of Polynesia as a society and culture. All the islands spoke different dialects of the same language and the Polynesians began inhabiting the peninsula around the 2nd millennium BC. From 1000 AD further colonisation and exploration occurred until the arrival of Captain Cook in the 1700s. The discovery of new islands by the ancient Polynesians may have been by fortuitous accident as they sailed the ocean in wooden canoes and navigated uncertain waters by the stars, waves and by keeping the shore within the line of sight. These voyages were replicated in 1967 with the maiden voyage of Hokule’a ship. The islands of Hawaii and Polynesia boasted as wildlife pigs, fowl and feral dogs and grew as their natural fauna breadfruit, taro, coconut and banana. Next, Professor Ruggles discussed the five different islands of Hawaii (Kau’i, O’ahu, Moloka’i, Mani and Hawaii) and their initial discovery and settlement by the native Hawaiians. Around 1000AD, the islands are discovered and colonised. In 1200-1400AD, the fertile and accessible agricultural wetlands are cultivated and in 1400-1600AD the distant and less bountiful agricultural dry-lands are brought under human dominion as rising populations force more people to move to previously inhabited areas. At the 1600AD mark, the development of the Hawaiian kingdoms began in earnest. These were archaic and hereditary with no towns or urban bases (Crops in Hawaii could not be stored or preserved; lessoning the need for towns). In the ethno-history and oral history of the Hawaiian kingdoms genealogy was of the utmost importance to the ruling classes. It heightened their status, showed them to be worthy kings and separated them from the common folk. Early Hawaiian Authors such as John Papa l’i and David Malo stress the massive significance and influence of genealogy within the Hawaiian elite class. The Kumulipo was a highly detailed and revered star chart describing the ancestry of the ancient Hawaiian kings, their importance to the universe and why they deserved to be rulers. The astroarchaeology of Hawaii and Polynesia concerns the astronomy, navigation and the influence of stars upon the material culture of each respective society. In navigation, the positions of stars at night can help with traversing the wide open sea and in learning the locations of islands. The rising and setting of stars can be learned off in order to use them as a sort of star compass. The coming of the missionaries to Hawaii in the 18th and 19th centuries resulted in the planets and many stars receiving new names albeit in the Hawaiian language. Lubika is Jupitar, Wenuka is Venus, Hipa-kane is the constellation Aries and Kr’aha is Ursa Major. In the Na i Noa Hoka, a catalogue for Hawaii star names, it shows the original Hawaiian names for the stars along with the ones the missionaries bestowed upon them at a later date. There are two editions of this book; one printed in 1975 and 2015. It also gives a star/genealogy chart tracing which kings and other elite classes are descended from which stars. In astronomy, the heliacal rise sees the stars rising at dawn around May/June. At the Acronychal rise the stars, after the earth’s rotation away from the sun, start to rise at sunset in November and in Hawaii these are noted for marking the New Year. In Hawaii, the Makaliki festival is held to celebrate the New Year and the god of agriculture, Lono. On the Island of Tongo, there is a coral tritithon called Ha’amonga a Maui which was built around 1200AD and has a solar alignment. After reading ‘Stonehenge Decoded’ and realising that he had a similar monument within his kingdom, the King of Tonga started a ritual ceremony at the monument in 1967. Also on the island are several solar calendar markers; most are located on the east side and are natural places for observation. The lava columns at Kumukahi are known as the “sun pillars”. In Hawaii itself the landscape is dotted with the ruins of temples and ancient shrines. The orientations for these structures are in a variety of directions and seem to correlate with whatever god is being worshipped. Ancient Hawaiian temples are called Heiau and are often made from stone, have a square shape along with an inside altar and contain varied offerings such as coral or beach worn pebbles. The ideal heiau has opposing female/male sides orientated along a south/north basis. Many of the Hawaiian heiau are located in Kahikinui Kaupo; overgrown agricultural dry lands divided into ten land sections (ahupaa’a) and have been surveyed by UC Berkeley. There are over 60 recorded and preserved heiau and the majority date to circa 1600AD. These temples usually have the altar opposite the entrance and their orientation is influenced by whatever god is being worshipped. Kane, as the god of the (east) rising sun, has temples with an east orientation. Kanaloa, god of death and the sea, has temples facing towards the ocean. Ku, god of war and the north, has north facing temples while Lono, god of fertility and agriculture, has southerly temples. On Hawaii, there is an archaeological monument in Kahiki Nu-e known as Panana which points to the south. It is a single wall with a notch in the centre. 20m long and 1m wide, the wall is unconnected to any other monument. In Hawaiian, Pa means wall and nana means sight. Panana is also the modern Hawaiian word for compass. Is this a memorial wall? Was this a connection to the days of voyaging and navigating by the light of the stars? We know that this monument was built around 1200AD, the time when the big voyages came to an end. It most likely commemorates the end of an era in Hawaii and is a symbol of nostalgia for a more adventurous sea-faring age.